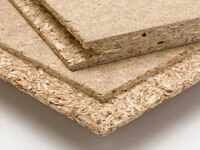 2400 x 600 Kronospan flooring grade T&G P5 chipboard, range of thickness' and types. (Floorboard) Kronospan T&G is durable, moisture resistant, easily worked, quick to install and economic to use. No wonder it's the prime choice in UK construction.P5 is ideal for loft conversions or area's where moisture may be a problemTongued and Grooved "easy” fit profiles.